This is completely unacceptable. Is this the future of movies at the mega-plex? In my opinion, this is another nail in the coffin! I would recommed the movie, but I cannot recommend seeing it in a theatre. Wait for the DVD! I wonder who else at the theatre thought the same? I wonder who will never return to a movie theatre after seeing this? I wonder how the producers of the movie and Robin Williams himself feels about the movie being disgraced like this? I wonder if they realize that this is why the movie isn't making money? If I were them, I'd be pissed. AMC thinks this is the new way to do things? THEY MUST BE STOPPED! Eric, when I went to see it, it was shown on a top masking screen with the masking set to flat. Keystoning was present on my image too but it did manage to fill most of the width. Had the masking been down, you may not have been able to notice the grays outside the image area because the projector is still pushing light where it supposed to be black. Trailers seemed to be presented in flat because they went below the masking. Problem is they use these projectors for other content too such as showing concerts and such. I agree that this was hard to watch. I have used my Cinema grade projector for a couple of similar things, projected in HD. Looks great, IMO. They probably didn't have the correct lensing to fill the height of the flat image (since almost every AMC theater uses top masking), so they set the masking to scope and went with that. Alternatively, it may have been a brightness issue. Smaller image = more light. Regardless there is no excuse for that location not adjusting the keystone correction to take care of the "pyramid" image. I would presume this is an isolated incident and not all AMCs are set up like that. This AMC (1000 Van Ness) has side masking in all auditoriums that I know of. They could have easily drawn the masking curtains in to at least not have blank screen showing. Unfortunately though, then it would look like a square TV set showing a DVD with the black bars at the top and bottom. Which is what it looked like anyway... just with additional blank screen on the sides all the way to the walls. Pathetic. Regardless, movies should not be presented this way in a movie theatre! It looked as though we were watching a DVD at home on our big screen, in letterbox with black bars at the top and bottom. And the whole image wasn't even on the whole screen. 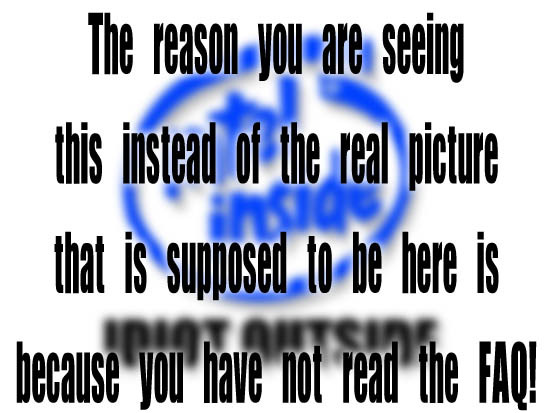 It was a picture, within a picture, within a small portion of the screen! I paid $10 for this? Another nail in the coffin for movie theatres! People aren't gonna pay for that again. I for one won't. I'll just stay home with my DLP In Focus projector and screen and rent DVD's. I never thought I would be pushed away from going to the movies... And like I said, how many other customers at the theatre feel the same way after this....? AMC is not only disgracing themselves, they're disgracing all movie theatres, and turning the public away from going back to ANY movie theatre, ever!!! So why didn't you go to the management, demand a refund, and express your dissatisfaction with the presentation? If you let the theatre keep your money without a fuss, how will they know you hated it? Just complaining here on Film-Tech won't solve anything. You have to hit'em where it hurts, i.e. the cash drawer. Although AMC execs read this and hopefully will take note of Eric's dissatisfaction with the presentation he received on this particular show and location, I must agree with Mike that the first step is to always refuse to leave the grounds without a refund. Then complain via letter to corporate and/or places like this. As far as I remember, the theatre on the second floor, off the hallway before you hit the mini-concession-lobby has top masking. Also, they have a full Cinema DLP set-up on one of the auditoriums there. I don't understand why AMC wouldn't play Final Cut on that? Umm, I did, but only after the movie. (Besides, that's not the reason I posted on here. I posted my experience because I wanted Film-Tech'ers opinion on this.) I wanted to walk out and get a refund right away when it started, but #1, the person I was with wouldn't have liked that, since they really wanted to see the movie, and #2, I really wanted to see the movie too. The 16 year old girl at the "guest services" advised "I know, my dad watched it the other day and he didn't like the picture either". I didn't feel right getting all escalated further on her because #1, I stayed and watched the movie and #2, what good will yelling at her do in the big picture? Instead, I did write to AMC and I've also sent an editorial to The Chronicle about this. We currently have a hot political measure on our ballot next week about our single screen theatres. I don't go to this theatre much, but yes, Mike, I believe you are right. It is theatre #9, which they were showing Ladder 49 in. It's a very tiny theatre. But still, I knew they had a theatre with a flat wall to wall screen and that was one of the thoughts that ran through my head when the movie started. Why weren't they using that auditorium. However, we were around the corner in auditorium #8, which I beleve is a larger auditorium, and it was quite a full showing. There is an interesting editorial in the newly arrived November 2004 issue of Film Journal. In what has to be a first for any trade magazine (I have never seen a trade magazine openly criticise anything before) FJ critises AMC's decision to use their pre-show advertising system for delivery of a feature motion picture. "We believe that if you are going to show a movie to an audience that pays a standard price, they deserve the best quality that technology can provide. Anything less is simply not acceptable." "The major concern with experiments using less than 2K is that you send a message to the general public to expect inferior quality. These experiments also chip away at the idea of a single global system and can result in the deterioration of any semblance of standards." "If a rollout of digital cinema is not achieved in 2005, we also fear that the major proponents and creators of digital equipment might have their financing and funding withdrawn by their parent companies. This would be a travesty. We hope that sound minds prevail in the coming months." I find it more than ironic that a magazine entitled "Film Journal" is so concerned about digital cinema. Well, I guess the AMC execs are probably the only ones who thought this was a good idea. I'd like to say "I told you so!" but I'm sure I'm not the only who said it. Anyone at our theater could tell you how crappy the digital pre show projectors look. Yes, even the 14 year olds who've never been in the booth, and the janitors who don't speak english. And the sound is "Oh My God" Horrible. There was talk at one point of putting the trailers on the pre-show projectors. I hope that idea dies a quick violent painful death. But I know AMC, and I predict that despite the criticism, they will continue to do this (because the execs don't care about presentation quality at all - if they did, they would burn down the theater down the street that proudly scratches amd mutilates half the prints they receive) and at the same time, they will call themselves "innovators". If the Regalistas or Cinemarkers ever pull that stunt here, they will be refunding my money every time, and they'll get scathing letters and emails, demanding to know what the hell they think they're pulling. I'll also make lots of noise here on this forum and I'll write letters to the entertainment editors of the local newspapers. I'll badmouth them to all my moviegoing friends too. That's just totally unacceptable and if AMC is officially sanctioning that, all I can say is god help the movie biz because they're committing business suicide. That's one of the most fucked-up things I've ever read here. I stopped by an AMC 30 plex recently as I had to waste 4 hours (on company time nonetheless) while waiting for a supplier to finish an order I was picking up. The popcorn was the worst popcorn I'd ever had! The lamp needed replacing sometime last year too. I also nearly broke my ankle and/or foot while falling down an unlite (and non-visible, even to someone who spends a lot of time in the dark) set of stairs in the back of the auditorium. Thank you, David, for understanding why I was so upset and why I posted the experience on here. It IS business suicide for ALL theatres if they keep this up!!! Unlit stairs are a challenge, sure, but you should really watch out for those splicers, too. They attack toes.